Masks allow you to protect parts of your image from being altered. There is only ever 1 mask at a time and it is always the same size as the current page. 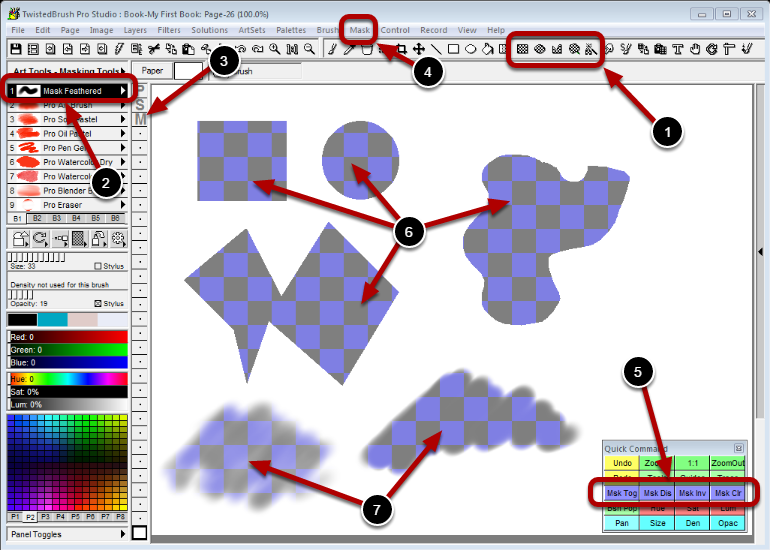 These are the Masking tools that can be used for creating and modifying masks. Masks can also be painted with the Masking brushes. The Mask Edit layer is a special layer for doing even greater levels of edits on the mask. The Mask menu gives access to a number of different options. The Quick Command panel has some buttons for quickly managing your mask. These elements of the mask were created with the Masking tools. These parts of the mask were created with the Mask brush.